Johann Bugenhagen by Lucas Cranach, 1537. Johann Bugenhagen (Doctor Pomeranus), the reformer of Pomerania, born 24 June 1485 at Wollin, educated at the University of Greifswald, was made rector of the city school at Treptow a. R.; on 29 April 1521 he matriculated at the University of Wittenberg, and soon became an enthusiastic follower and effective co-worker of Luther. Having become city pastor in Wittenberg and a professor at the university, he performed Luther's wedding ceremony. He died 20 April 1558. His historical importance lies in the organization of churches and schools in various states of North Germany, especially in Hamburg (where his work was interrupted by an invitation to the Flensburg disputation), in Lübeck, and in Pomerania. In his attitude toward the Anabaptists Bugenhagen closely followed Luther. He was a signatory of the opinion of the Wittenberg theologians of 5 June 1536. Among his books were found two documents (Theologische Studien und Kritiken 1886, 164), in which he refuted point by point the so-called Augsburg Articles (Anabaptist) ("the following articles some in Augsburg presented to the council and willingly confessed that they consider them true, for which they are lying in prison") and the Nikolsburg Articles (see Confessions of Faith), which he uncritically ascribed (in line with the common assumption) to Balthasar Hubmaier. In his conflict with the Anti-Trinitarian Johannes Campanus, Bugenhagen published a new edition of Adianasius, Contra idolatrium et de fide sancta. He also wrote a foreword to the book by Dorpius on the fall of Münster, and Bekenntnis von seinem Glauben und Lehre, geschrieben an einen Wiedertäufer zu Wittenberg (Nürnberg, 1536), the first edition of which had appeared in the preceding year under the title, Bekenntnis Bugenhagens von seinem Glauben und Lehre, geschrieben an einen Wiedertäufer. The Anabaptist cited in the foreword is Hans Sturm of Styria, Upper Austria, in whose conversion Bugenhagen took a special interest. Of unusual interest is Bugenhagen's part in the Flensburg disputation of 8 April 1529, held against Melchior Hoffman and some of his followers. Bugenhagen presided with Duke Christian. Chief spokesman was Hermann Fast, the reformer of Husum. In conclusion Bugenhagen summarized all of Hoffman's articles in a lengthy refutation. When Hoffman published his Dialogus describing the course of the debate, Bugenhagen published the official record of the disputation, which Krohn put into his Geschichte der fanatischen und enthusiastischen Wiedertäufer . . . (Leipzig, 1758) 153-200. In the first part of the book, Von den vngeborn Kindern/ und von den Kindern/ die wir nicht teuffen können/ Vnd wolten doch gern/ nach Christus befehl/ Vnd sonst von der Tauffe . . . (1557), Bugenhagen speaks about baptism in general and attempts to refute the views of the Anabaptists along these lines. His arguments are the usual ones, namely, that baptism and circumcision are the same and that baptism therefore should be administered to children, etc. At the end of the major part of the book he relates that Luther had instructed him to write the book, had read it and was pleased by it. However, Luther had asked him to add something to comfort the mothers whose children had died before they were baptized. After Luther himself has added some seven pages on this subject Bugenhagen takes up the subject. Again some references and attempts at refutation of Anabaptist views are made. The book is also significant as a source of information regarding baptismal practices and modes in the days of the Reformation. Krohn asserts also that in the Martyrs' Mirror of 1660, v. II, p. 77, van Braght stated that Bugenhagen had opposed infant baptism in his book, Von den ungeborenen; this error was corrected in the 1685 edition of the Martyrs' Mirror. Cornelius, Carl Adolf. Geschichte des münsterischen Aufruhrs: in drei Büchern, 3 vols. Leipzig: T.O. Weigel, 1855-1860: v. II, 279-282. Dorpius, Heinrich. Wahrhaftige Historie, wie das Evangelium zu Münster angefangen und durch die Wiedertäufer zerstöret wieder aufgehört hat 1536. [Nürnberg] : [Petreius], 1536: Salig III, 402. Hege, Christian and Christian Neff. Mennonitisches Lexikon, 4 vols. Frankfurt & Weierhof: Hege; Karlsruhe: Schneider, 1913-1967: v. I, 290. Ruccius, Walter M. John Bugenhagen Pomeranus, a Biographical Sketch. Philadelphia: The United Lutheran Publication House, 1925. Zeitschrift für Kirchengeschichte (1911): 297. Neff, Christian and Cornelius Krahn. "Bugenhagen, Johann (1485-1558)." Global Anabaptist Mennonite Encyclopedia Online. 1953. Web. 19 Apr 2019. http://gameo.org/index.php?title=Bugenhagen,_Johann_(1485-1558)&oldid=144897. Neff, Christian and Cornelius Krahn. (1953). 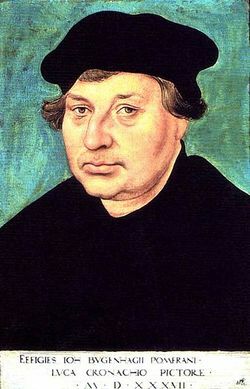 Bugenhagen, Johann (1485-1558). Global Anabaptist Mennonite Encyclopedia Online. Retrieved 19 April 2019, from http://gameo.org/index.php?title=Bugenhagen,_Johann_(1485-1558)&oldid=144897. Adapted by permission of Herald Press, Harrisonburg, Virginia, from Mennonite Encyclopedia, Vol. 1, pp. 463-464. All rights reserved.